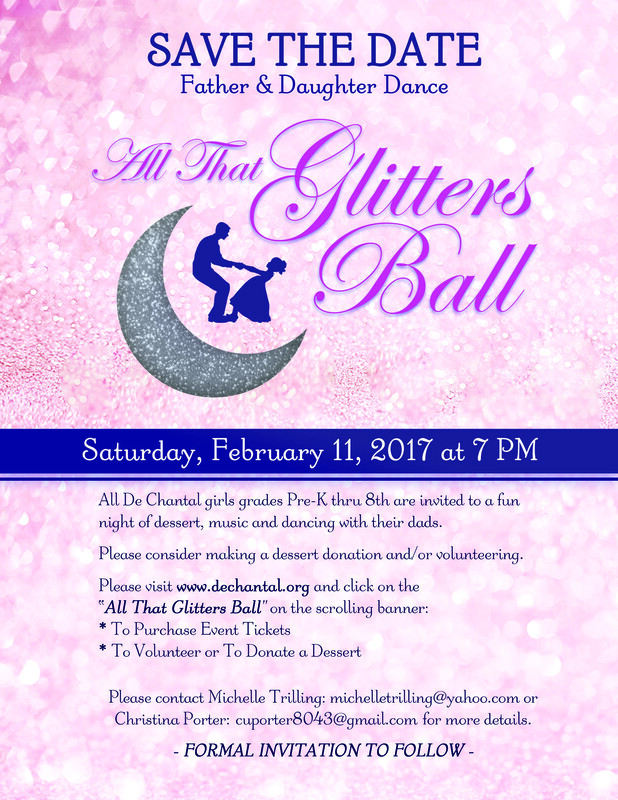 Date: Saturday, February 9th 7:00 – 10:00 p.m.
All de Chantal girls Pre-K through 8th grade are invited to have a fun night of desserts, music and dancing with their dads. Please RSVP to the Ball by February 1, 2019. If you would like to order a wrist corsage and/or boutonniere. Corsages and boutonnieres will not be sold at the event or available for purchase after the February 1st. ~ Multiple surprise raffle items from: Kendra Scott, LuluLemon, Paper Source Card Party, Dry Bear, American Girl Doll, Sparkle Monkey, Summer Dance Camp at Rock Creek Dance Academy and Falls Road Golf. ~Desserts and DJ Dancing with instruction on the popular dance favorites! ~ "Best Dressed Dad" Contest for the dad with the snazziest duds! ~ Great favors, plenty of fun and wonderful memories to cherish! Please click here to purchase tickets online ahead of time and only tickets for the event can be purchased at the door the night of the event. Please consider making a dessert donation for the evening and/or volunteer to help set up, clean up or during the Ball we still need lots of volunteers to help. To volunteer please click here. Please contact Andi Stancik with any questions.